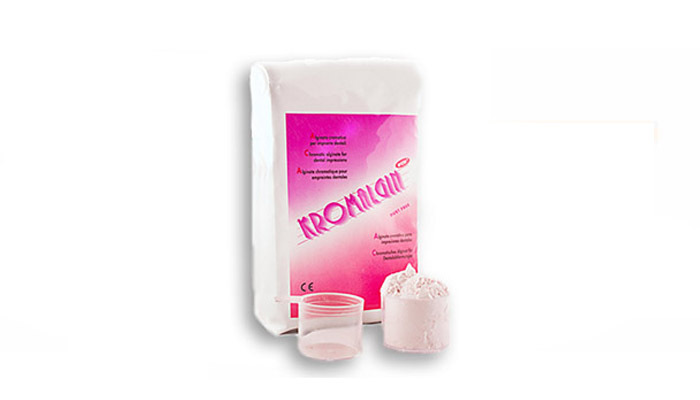 KROMALGIN Più – Alginate for high quality Dental impressions with a phased chromatic indicator. The special formulation of the product eliminates dust during its use and moreover the product permits the correct use of the material without resorting to mixing times, thanks to the presence of ingredients that change colour during the working and setting time of the material. KROMALGIN is indicated for all routine dental impressions, reproduction of dentures, orthodontic appliances, study models etc. The product conforms with: ISO 1563 (1990), ADA 18.